Chameleons have a reputation for changing colors rapidly to disguise themselves in their natural habitat. Although chameleons do hide by changing colors, that's more of a perk. They use this biological ability primarily for other reasons. And when they go to sleep at night, the show is over. 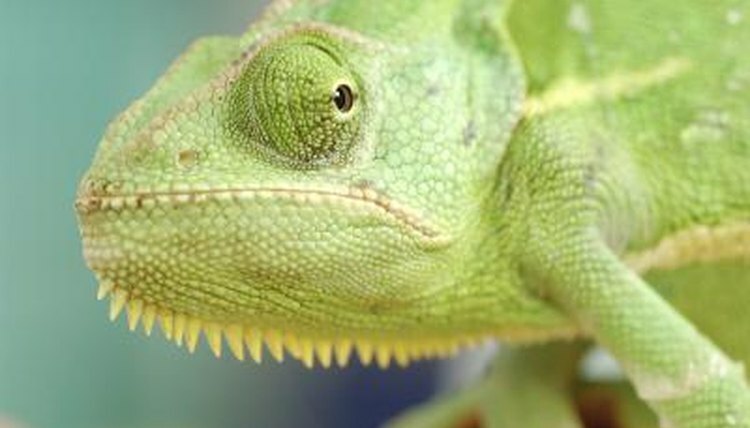 A chameleon is able to change the color of his body at will, and he can look completely different in about 20 seconds. However, that doesn't mean that chameleons are magic. Most of them tend to live in an area that matches their natural color -- naturally green chameleons, for example, live in the jungle. Chameleons have several layers of skin that allow them to hide using their natural camouflage abilities. The outer layer is transparent. The layers underneath comprise colored cells that expand and contract. When the chameleon needs to change colors, his colored cells expand and contract to suit his needs. For example, a naturally green chameleon typically has his green cells expanded. If he wanted to turn red, his red cells would expand to change his overall coloring. Although chameleons hide using their color-changing capabilities, that's more of a bonus. Most chameleons change color to communicate with other lizards. Sometimes the color change is a natural reaction to a shift in mood. At other times they purposely change colors to communicate a desire to mate or a warning to stay away. Chameleons do change their coloring to hide from predators, but the system isn't perfect. For example, at night these creatures often lose their coloring altogether and go pale, like when your computer's screen saver clicks on. Ultimately, though, chameleons can't hide from their biggest threat, deforestation. Although their natural camouflage has helped these creatures survive for more than 80 million years, no amount of color changing can hide them from this loss of habitat.